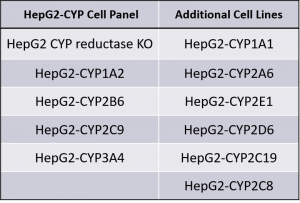 We have assembled a panel of HepG2 transgenic cell lines that each stably express one of the major human CYPs (originally published by Takeda Pharmaceutical Company Limited, Osaka, Japan) and utilized gene editing technology to create a CYP reductase (POR) knockout HepG2 cell line. The HepG2-CYP cell panel has been fully validated in-house at Hera and published in our SOT 2017 poster Effect of Transfecting HepG2 with Human CYP Enzymes on Chemical Toxicity. Additional Cell Lines were created by & validated at Takeda Pharmaceutical Company Limited (Osaka, Japan). Please see publication citations below. 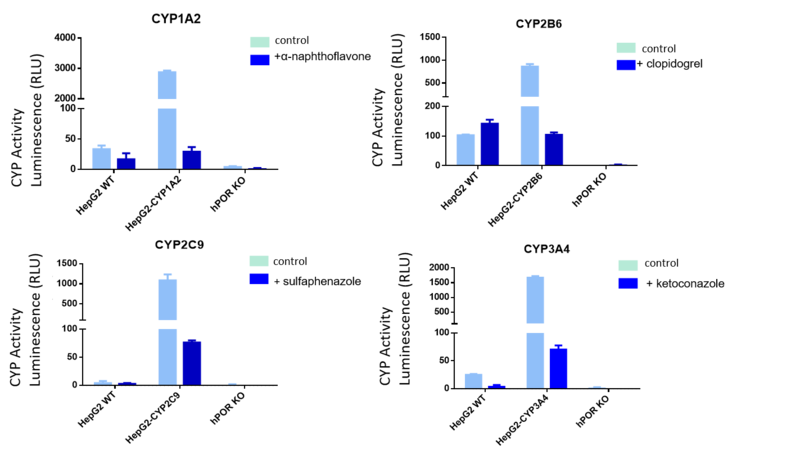 CYP activity in HepG2 WT, HepG2-CYP transgenic and HepG2-CYP reductase KO (POR) cells. CYP activity was measured with P450 –Glo™ assay kits. Specific CYP activity in transgenic cells was confirmed with CYP-selective competitive inhibitors, namely 5 µM α-naphthoflavone (CYP1A2), 1 µM clopidogrel (CYP2B6), 2 µM sulfaphenazole (CYP2C9), and 1 µM ketoconazole (CYP3A4). Cells were treated with varied concentrations of aflatoxin B1 with or without 1 µM ketoconazole (CYP3A4 inhibitor). In cells treated with aflatoxin B1, concentration‐dependent cytotoxicity (based on loss of cell viability) was enhanced by the expression of CYP3A4 and suppressed by CYP reductase knockout. In HepG2 WT cells and HepG2-CYP3A4 cells, co- incubation with 1 µM ketoconazole partially protected against the toxic effect of aflatoxin B1.